She’s Gotta Have It is good. If you look at Spike Lee’s career, it’s easy to fault him for his missteps: He has difficulties portraying characters outside of his male experience, his range is often harmed when his ideas get too expansive or the material is too different from his own life. All of these issues caused Lee’s last venture, Chi-Raq, to bomb. Even the original She’s Gotta Have It, while critically acclaimed, suffered from similar issues with Lee later regretting major plot choices and many criticizing its focus on the male perspective. A modern version of She’s Gotta Have It, “for the Twitter age” as the show was marketed, could’ve been a disaster for a director who mostly excels when he focuses on capturing a specific moment in time. Fans can rest easy—She’s Gotta Have It is not a disaster. In fact, it is perhaps Lee’s best work in decades. The Netflix series is stunning in its visuals, performances, soundtrack, and voice. Without Lee taking on all of the writing and production credits like the original film, the show is able to truly offer complex depictions of modern blackness, and Lee is able to focus on creating and capturing a tiny universe in Brooklyn’s Fort Greene within the space of 10 episodes. Lee’s direction does not overwhelm; he collaborates beautifully with his wife and co-executive producer Tonya Lewis Lee, who sought to redesign She’s Gotta Have It for the modern age. Lee pulls together over-the-top satire at times that mimic the best of his film Bamboozled while remaining rooted in a reality reminiscent of Do The Right Thing’s haunting portraits. This is a quintessential Spike Lee joint, but it is not Lee’s voice alone and that’s for the best. A powerful group of black female writers are behind the show’s scripts, and they have no difficulty making their voices feel as large and looming as Lee’s. The story of Nola Darling, a modern black woman who refuses to be tied down, expands to include issues of gentrification, sexual assault, and modern politics. Nothing in the show feels dated; rather, the show feels incredibly timely. 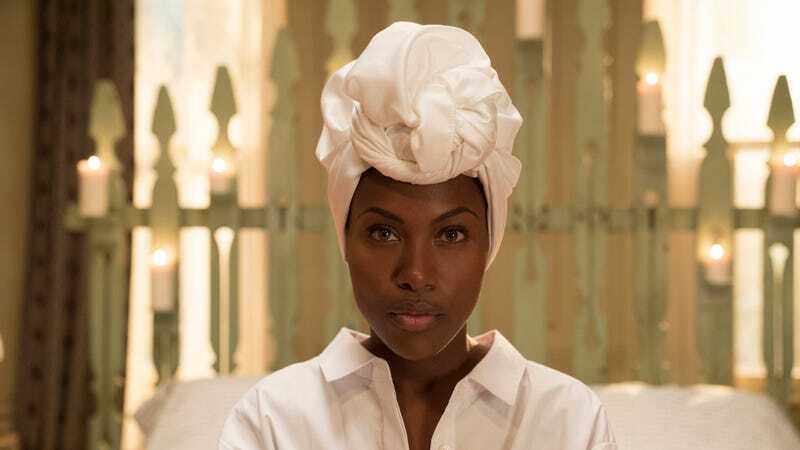 She’s Gotta Have It emerges as a perfectly timed catharsis against the current onslaught of whitewashed TV shows set in New York, male abusers, and disappointing feminist figures. Nola’s decision to change her life and rethink the roles of the three men she dates is now rooted in a demand for empowerment and justice in Trump’s America. DeWanda Wise turns in a brilliant, moving performance as Nola. She’s able to betray Nola’s insecurities in a glimpse while commanding a magnetic presence that leaves viewers as much in love with her as her three suitors. Nola is an imperfect, powerful narrator and Wise’s performance asks us to support her, question her and even dislike her at times. The success of She’s Gotta Have It relies on its leading lady, and her performance alone makes the show a stunning character study. The three men (and one woman) in Nola’s life—played by Lyriq Bent, Cleo Anthony, Anthony Ramos, and Ilfenesh Hadera—alternate between representations of the system Nola rages against to fully formed characters who are given a depth the film didn’t have space to include. Ramos, Anthony, and Bent have no problem keeping up with Wise, and all three offer stories as Jamie, Greer, and Mars, respectively, that are compelling perspectives on black masculinity and male fragility. In particular, Nola’s lone female lover, Opal (Hadera), is expanded to beautiful depths that allow for an incredibly intriguing look at modern bisexuality and dating. The show is even successful with stories outside of Nola’s dating life. Chyna Layne and rapper Fat Joe enjoyably fill the show’s universe with a heartbreaking storyline around black female body image, botched plastic surgery, and the male gaze. This isn’t just Nola’s story anymore; it’s the story of these men, her friends, Opal, and Brooklyn. It’s a beautiful love story and memorial to black art and culture. Between scenes, album covers ranging from Solange to Roberta Flack make sure the audience knows there’s a distinct relationship between the dialogue and the music that should be noticed. From a sentimental montage that examines how each character reacts to the election of Trump, to Nola visiting the graves of historical black writers and musicians, She’s Gotta Have It asks us to remember what has been lost and what still has the potential to be given up in these intense times of fear and mistrust. She’s Gotta Have It is also one of the best uses of the Netflix format since Stranger Things and Orange Is The New Black. It is at once binge-able and episodic. It features a stunning opening sequence that confirms Myles McNutt’s “Do not skip the intro” theory. Alternating images of Brooklyn past and present, day and night fill the screen over a beautiful jazz score, continually setting the stage for the teleplay that follows. The show is unlike anything previously seen on the platform, and it feels like a high-water mark that may define an age of prestige Netflix television.